Taylor Thatcher, protagonist and point-of-view character of Peter M. Wheelwright's first novel, set at the end of the last millennium, tries to make sense of how the world works, and so seeks unifying concepts. His brother, Bingham, or "Bin," delights in particulars. They are epistemological yin and yang and, like the taijitu symbol of two nestled fishes, they complement each other. As Taylor says, "My brother and I know the stars by different names." They also share the same birthday, born two years apart. They are in fact half-brothers, and also cousins. Taylor's mother, Lily, drowned in a canoe accident when he was a toddler. His father then married Lily's identical twin, Roseanne. She gave birth to Bin, and immediately after succumbed to diabetic complications of pregnancy. Rose was quickly supplanted as a caretaker by Esther, a Cajun who came north to Maine seeking the origin of her ancestor, a French Acadian forced by the British to move to Louisiana. Taylor's memories of his mother and stepmother are "Vague, diaphanous." It seemed to me I had been born into a pretty fast-paced but solemn world...with a lot of black and white and the sense that I'd better start paying attention. Taylor's and Bin's father is a physician, but he is always called "the Deacon," his ecclesiastical title as a senior layman in the Congregational Church of Mount Vernon, Maine. The pulpit of that church is manned by The Reverend Samson Littlefield, whose homilies partake more of the hellfire of Jonathan Edwards than of the latitudinarianism of today's United Church of Christ, unlikely ecclesiastical successor to the severe Calvinists of Edwards' time. The minister's wife, Felicity, teaches Sunday school and tries to make her husband's sermons palatable and comprehensible to the children. She is relieved when Esther suggests that Taylor, who seems disengaged from the proceedings, be excused from the class along with Bin, who asks "difficult questions about miracles." The Rev. Littlefield eventually mimics his Biblical namesake by bringing the church building down around him and his wife, who proves, in a moment traumatic for Taylor, to have more in common with Delilah that we are at first led to believe. I had my own ideas about the space-time continuum; a different theory of relativity. I wondered if the heavens were only being reshuffled in order to fit the circumstances here at home, in the moment, on the ground. This reminded me of an assertion made by NYU physics professor Alan Sokal in 1996, about the time when Taylor would have been in grad school: "the pi of Euclid and the G of Newton, formerly thought to be constant and universal, are now perceived in their ineluctable historicity." This was part of an article Sokal submitted to the cultural studies journal Social Text, which had published articles suggesting that knowledge gained through science was "socially constructed" and not objectively universal. After Social Text published Sokal's article, he announced that it was a hoax. Has the Deacon prevailed, after all? It's not that simple. Despite whatever doubts Taylor has about the Deacon's philosophy, doubts that could only be exacerbated by the Deacon's behavior shortly before his death and by the manner of his death, Taylor keeps on seeking Truth. It may prove to be the inverse of the Deacon's Truth, just as the novel's title is an inversion of the Lord's Prayer. Taylor's seeking leads him to Mexico, to the Mayan ruins of Yucatan and Chiapas, where he meets Nicole, who will for a time be his wife. The marriage is stifled under the burden of Taylor's seeking, and Nicole returns to Rafael, the Mexican lover from whom Taylor won her. I have to hand it to Rafael. He leans eagerly into the future with both feet on the ground, a reformed hidalgo intent on things-in-the-making. I keep drifting backwards in storm clouds, unredeemed, trying to unravel things past. The word "burden" seems to appear frequently in Taylor's narrative. He bears the burden of losing two mothers, of his father's alcoholism, and of the Thatcher history: exile to Maine on account of an ancestor's apostasy from the religious orthodoxy of Massachusetts Bay. The greatest burden, though, concerns Bin. Taylor frequently refers to something cryptically: "the Fall" and "the Stigmata." Its nature isn't completely revealed until near the book's conclusion. Lest you think this novel is entirely Dostoyevskian spelunking through the caverns of the human soul, it has more than a few brighter moments. Early on, they include Taylor's socializing with his faculty colleagues, a predictably eccentric lot who could easily migrate to the pages of works by David Lodge or Kingsley Amis. An ultimately leavening influence on Taylor's state of mind is the arrival, late in the Deacon's life, of a third, and female, Thatcher half sibling. Christened Evangeline, she is called "Angie" until she's old enough to announce her own preference, which is to be "Evie." (Now there's a fresh beginning for the Thatcher clan.) Most importantly, encouragement comes to Taylor in the form of Miryam, a graduate art student whose photographs of bridges and Nefertiti-like profile catch his eye. Much of the first part of the novel is taken up by flashbacks in which Taylor tells his history, but it concludes with a rush of action as Taylor and his SASS colleagues converge with their rivals from ARSE for a conference in which Taylor plays an unexpected role. This takes place in the southern Connecticut realm dominated by the casinos of the Mashantucket Pequots and the Mohegans, once battlefield enemies and today rivals for gamblers' dollars. Rafael attends with now pregnant Nicole, and cements a Mayan alliance with his distant northern cousins. Taylor and Miryam visit the nearby home of Taylor's widowed grandmother, where Miryam bonds with Evie. And Bin, accompanied by Jemma McMoody, Galen's daughter, makes an announcement that brings to mind the legend of the Fisher King. At its conclusion, As It Is On Earth made me think of the final sentence of my favorite Kurt Vonnegut Jr. novel, God Bless You, Mr. Rosewater: "Be fruitful and multiply." 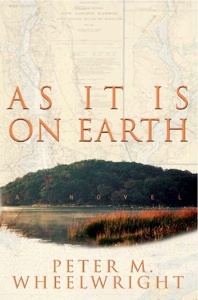 As It Is On Earth is published by Fomite, Burlington, Vermont. A great sentence among many in your engaging review of Wheelwright's book: "Lest you think this novel is entirely Dostoyevskian spelunking through the caverns of the human soul, it has more than a few brighter moments." I am so pleased that the book inspired you to write such an interesting post. It's Chanukah, and Chanukah it is.